Want bread on the table in about half an hour? It’s magic! 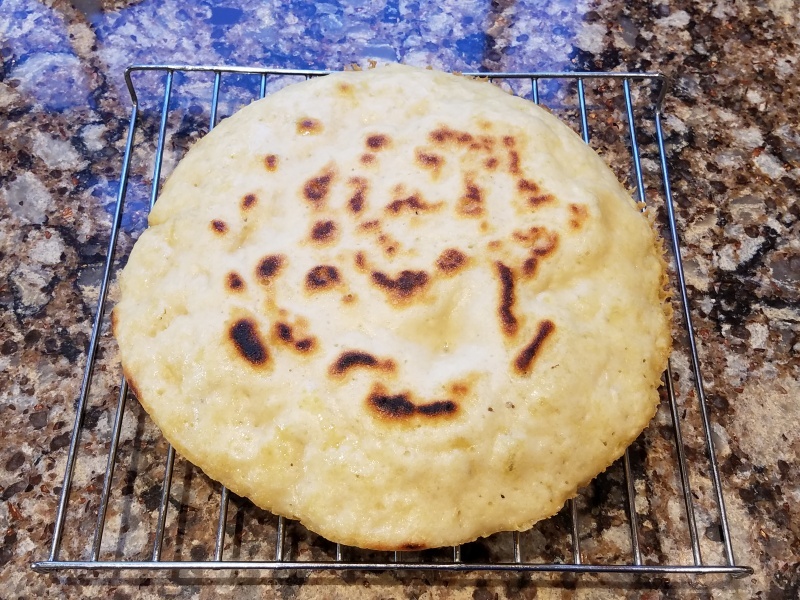 I was watching some videos from Jacques Pepin’s “More Fast Food My Way” show, and was excited by the idea of the Tibetan-style flatbread in Episode 221. I’ve tried it several times now, making it plain, with herbs, and also gluten-free and sourdough versions. They were all great. The gluten-free version was nearly identical to the regular one! If someone didn’t know it was gluten-free, they might not be able to tell. From the ingredients, I expected it to be like a baking-powder biscuit. But instead, I thought it was more like foccacia in both taste and texture. 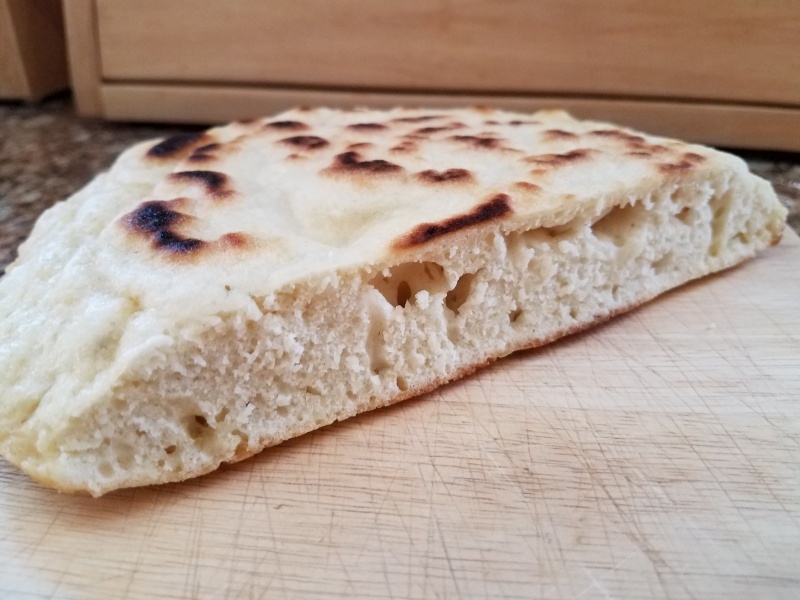 In fact, just add some appropriate herbs and seasonings, and it makes a great foccacia. The most important thing about making this bread? LET IT COOL. Resist all temptation to cut into it right away. It’s hard, I know, but I guarantee that the bread will be very gummy in texture if you don’t. You don’t have to let it cool completely to room temperature, but you probably want to give it at least 10-15 minutes to rest. That lets the internal steam continue to cook the bread and then dissipate. Even with the cooling period, you can still be eating it in about half an hour, since it only takes about 20 minutes to make. You will need a 10-11″ skillet (preferably non-stick) with a tight-fitting lid. Put the flour, baking powder and salt into a bowl, stir, then add 1 cup water and stir. It will be a very wet, gooey batter. You can review the video to see what the batter looks like. Add in any desired herbs or optional ingredients. Put the 2 Tablespoons of water in a small container and put it by the stove so it will be measured and handy when you need it. Spread the dough into a flat layer with a spoon or spatula if necessary. 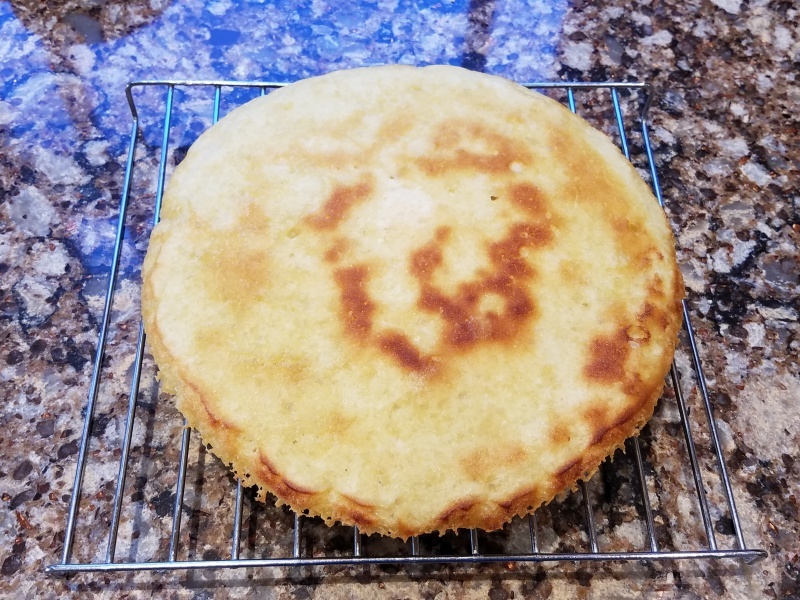 If you have to use a pan larger than 10″, you may want to leave space around the edge of the batter, rather than spreading it all the way to the edges. I’ve made it in a 12″ pan, and just left about a 1″ space all the way around the outer edge. Pour the 2 tablespoons of water around the outside edge of the dough where it meets the pan. This will create steam. Cover the pan with a lid and cook about 10 minutes. After about 10 minutes, flip the bread. The first time you make the bread, you might want to check it a little early to make sure it isn’t burning on the bottom – reduce heat if it is. Replace the lid and cook an additional 5 minutes. Let cool on a wire rack before cutting. I make it exactly the same, just substituting 1 1/2 cups King Arthur gluten-free flour for the all-purpose flour. Because of the difference in flour, the batter will be runny, like thin pancake batter. This is perfectly fine. (I tried reducing the water the second time I made it, and it wasn’t as good – so stick with the original amount of water.) I have not tried making this with any flour other than King Arthur, so you’re on your own if you use something else. Got sourdough? Just substitute some of your sourdough starter (fed or unfed) for a portion of the flour and water. My starter is 100% hydration (equal weights of water and flour). If yours is different, you will have to adjust the ratios a bit. My starter weighs about 8.5 ounces (240 grams) per cup when stirred down. I used 4 oz (by weight) of sourdough starter (this is a generous 1/2 cup by volume), 1 cup flour, and 3/4 cup water. I kept the salt and baking powder the same, but I might reduce the baking powder to 1 teaspoon next time and see how it works out, since the sourdough provides some leavening. I’ve only done this once so far, but it turned out great. I think this will be an excellent use for “discard” starter. If you want to use 8 oz (by weight) of sourdough starter, I’d suggest using 1/2 cup flour and 1/2 cup water. 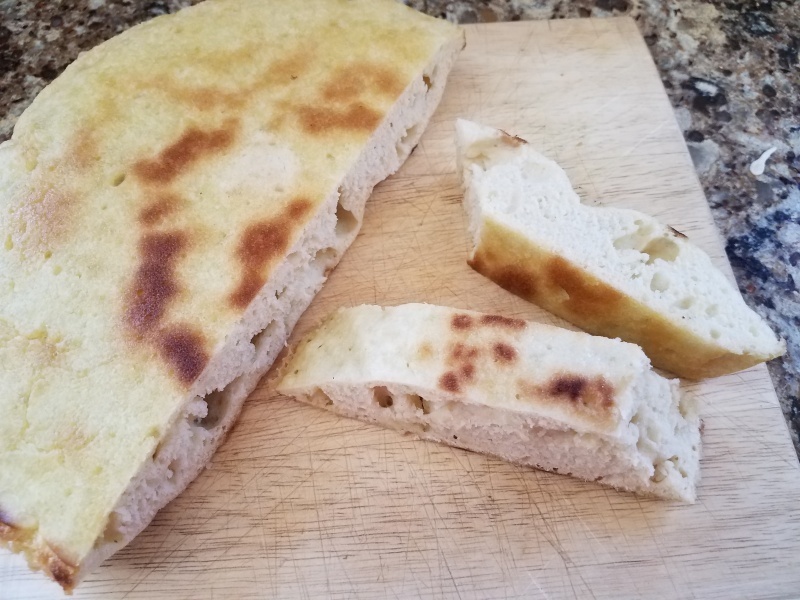 This entry was posted in food and tagged bread, gluten-free. Bookmark the permalink. Mmmmm! Looks yummy. Is that the amount of baking powder you use where you are? Since we moved to CO I’ve found I have to cut baking powder in half for the altitude. But since you’re in SLC maybe I don’t need to do that. Yes, I use 1 ½ teaspoons.